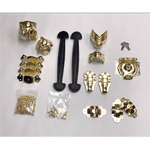 Hardware Kits Do you have an antique cabinet or hutch that's missing some essential hardware? 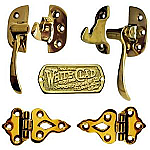 Maybe you have most of the pieces but would like all of the cabinet hardware to match. 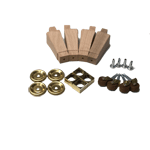 In either case, at Kennedy Hardware we make furniture restoration easy with our hardware kits. 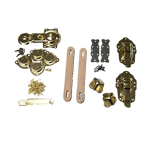 Whether you've got an American Woodworkers Hoosier Cabinet project to complete, or you possess a 1921-style Hoosier Cabinet, an antique ice box or a vintage pie safe, we carry the replacement hardware kits to make sure you have essential hardware pieces to complete your restoration project in style. 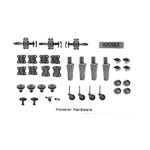 Our 1921 Hoosier Cabinet basic hardware kit, for example, contains everything from replacement wood legs to tambour door material. 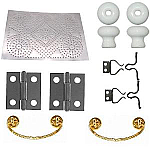 Of course, we also include essential reproduction metal hardware. 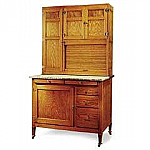 And if the basics aren't enough, select our add-on package, which includes items commonly missing from antique Hoosier cabinets -- items such as door charts, a cook book holder, the carousel spice rack, and Mission spice jars. 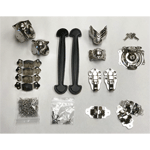 So don't waste time and energy searching flea markets and buying replacement hardware piecemeal. 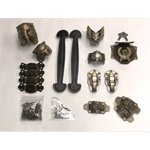 Browse our unique online selection of antique restoration furniture hardware kits instead. You'll be glad you did!